Anterior cruciate ligament rupture is a frequent injury to the stifle joint or “knee” in the Shar-Pei. I believe it has much to do with the structure of the breed – heavily muscled with a low center of gravity. Also the tendency of the breed to luxating patella (loose kneecaps) is a contributing factor in many cases. The function of the cranial cruciate ligament is to stabilize the stifle joint by limiting internal rotation and forward displacement of the lower leg bone, the tibia, relative to the femur or upper leg bone. It also serves to prevent hyperextension of the stifle joint. 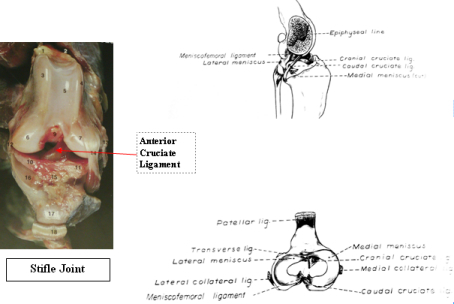 The function of the ligament also gives us some idea of the forces which can cause its rupture i.e. Hyperextension as occurs when the dog steps into a hole or slips out at a fast gait or severe internal rotation as occurs when the dog plants its foot and then turns suddenly toward the limb. This injury also occurs commonly in human athletes involved in football, hockey, basketball and baseball. Not treating the condition is one of the more common causes of degenerative joint disease (arthritis) of the stifle joint with changes occurring within a few weeks and severe changes within a few months. In addition to the injury of the ligament damage can also occur to the menisci which are cartilage cushions within the stifle joint. The damage to the cartilage more often occurs to joint instability caused by the ruptured ligament than by the initial trauma itself. Lastly, partial tears of the ligament can also occur usually with less severe clinical signs. The typical presentation consists of a Shar-Pei who was out in the yard running around and when let into the house is found to have a non-weight-bearing lameness. Sometimes this occurs in the house after jumping up or down off furniture or slipping on tile or wood floor surfaces. The dogs are usually completely off the leg for several days to several weeks and then begin to start touching the leg down demonstrating a limp. The physical examination is the most important part of the diagnosis as radiographic changes are not seen early in the course of the condition. The vital diagnostic test involves the anterior drawer motion test. Drawer movement is the sliding of the tibia or lower leg bone forwardin relation to the femur. The normal anterior cruciate ligament prevents this abnormal movement. This test should be done with the stifle joint in extension, normal position and in flexion to adequately evaluate the ligament. The test can be difficult to interpret due to lack of relaxation on the part of the dog, chronic ligament ruptures, partial ligament tears and presence of meniscal (cartilage) injuries. Another test called the tibial compression test produces indirect drawer movement by holding the stifle in slight flexion and flexing the metatarsal (ankle) as far as possible. The fingers holding the stifle can detect the forward movement of the tibia. This technique doesn’t work as well for me. I think it is also important to emphasize here that many Shar-Pei need to be sedated or anesthetized to palpate the stifle joint. If the dog is not relaxed or is painful these tests are very difficult to do and/or interpret. Having the dog under anesthesia also makes it easier to obtain quality stifle radiographs to look for evidence of degenerative changes. With chronic disease the tissues around the stifle joint become thickened and fibrotic making it difficult to elicit anterior drawer movement. Often there is a firm swelling on the inside of the stifle joint in more chronic cases called a medial buttress. This may be a consequence of chronic meniscal injury. Treatment options consist of conservative and surgical protocols. Degenerative joint disease will develop in the joint no matter what course is taken although it is felt that less joint disease develops when surgical treatment is elected. Conservative treatment consists of different variations of exercise restriction and/or splinting. The general consensus is that most stifle joints should be opened, explored, cartilage damage assessed and treated and the joint stabilized by any number of surgical techniques which will be discussed later. Surgical options consist of extracapsular techniques, intracapsular techniques and a combination of both. Imbrication techniqueInvolves placement of sutures on either side of the joint eliminating anterior drawer movement. It is commonly used in conjunction with other procedures. This procedure involves placing a suture around the lateral fabella (located in one of the origins of the gastrocnemius muscles behind the stifle joint) and attaching it to the distal patellar ligament. This technique consists of a combination of the first two procedures. Here a suture is passed from the lateral fabella and another from the medial fabella to the patellar ligament. This is one of the most commonly used techniques for anterior cruciate ligament repairs. Here the fibular head (the fibula is the smaller bone in the lower leg) and the attached collateral ligament are moved forward and attached to the tibia by a screw. 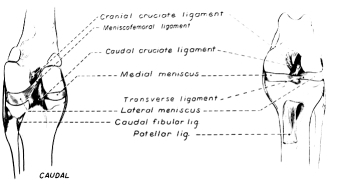 The lateral collateral ligament then functions similarly to the sutures in the previous techniques. Intracapsular techniques use various grafts from fibrous tissue in the stifle region to serve as grafts for the ruptured anterior cruciate ligament. These grafts usually follow the natural path of the cruciate ligament in an attempt to replicate the normal function of the ligament. These are technically more demanding procedures and usually done by veterinary orthopedic surgeons. This technique named after its originator involves harvesting a strip of the fascia lata (fiberous connective tissue in the outside of the thing) and using it to replace the ruptured anterior cruciate ligament. Here a cruciate ligament replacement is harvested from the patellar ligament, some of the patella and quadriceps tendon. In this technique the fascia lata is used but passes in a different manner through the joint than in the Paatsama procedure. This technique utilizes the three-in-one technique plus adds the over-the-top procedure as well. This is used in larger animals and very athletic smaller breeds. A recent innovation in veterinary orthopedic surgery is the use of arthroscopy to repair ligament injuries and/or cartilage injuries. This modality is extensively used in human orthopedic joint procedures due to the advantages of quicker return to function, decreased length of hospital stays and less surgical trauma with better cosmetic appearance. It does require specialized and expensive surgical equipment and additional extensive training. The advantages in veterinary medicine include the ability to do detailed joint inspection which facilitates the diagnosis of joint disease, shorter surgery time, and a better cosmetic result. At this time arthroscopic surgery of the stifle joint is limited to diagnosis of joint disease and correction of cartilage problems such as osteochondrosis lesions, etc. Due to the number of available surgical procedures, differences in breed size and weight and differences in athletic ability of breeds I refer anterior cruciate ligament ruptures to a board-certified veterinary surgeon for proper repair. A surgeon has the experience, training and tools to utilize the proper surgical technique for the specific size, weight and exercise requirements of the particular dog. Certainly there are general veterinary practitioners who see anterior cruciate ligament ruptures on a regular basis who can repair these injuries but they generally have experience with one or two procedures which they use for every case. I should also comment on the importance of physical rehabilitation after the surgery. In recent years the importance of physical rehabilitation has been realized in veterinary medicine and veterinary rehab centers have started springing up. Physical therapy involves massage, underwater treadmills, swimming, magnet therapy, ultrasound therapy, acupuncture and chiropractic modalities. While the surgical repair of anterior cruciate ligament injuries is important, equally important is physical rehabilitation to maintain muscle mass and function.